Summer means long days at the pool, time spent running through sprinklers and splash pads with breaks in between to snack on watermelon and popsicles. But here in Austin, summers also mean long, hot days when staying in air conditioned buildings becomes the priority of the day. If you're itching to get out of the house while also staying cool, and you need a break from the pool, The Bullock Texas State History Museum is a great option. The Bullock Museum is a sponsor of the 2017 Austin Summer Fun Checklist for Kids! Complete three items on the checklist and your kids can start earning prizes and discounts from local companies. 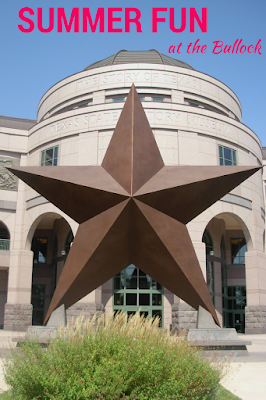 Save $2 on exhibit admission at the Bullock Texas State Museum. You can always find engaging exhibits on Texas history, but the exhibit you don't want to miss this summer is Pong to Pokémon: The Evolution of Electronic Gaming. Opening July 29, this exhibit will explore the history of gaming and where it's headed, with a special emphasis on Texas' role in the industry. (Did you know that Texas ranks third in the nation in number of video game personnel?) There will be classic games available to play (no quarters needed!) like Oregon Trail, Centipede, Tetris and more. All summer long, the Bullock Museum is presenting a biweekly Summer Free Family Film Series. This year's theme is A Magical Fantastical Adventure. The movies are free and open to the public with preferred seating for museum members. All seats are available on a first-come, first-served basis, but museum members have priority seating. Guests do not need to purchase tickets, but simply show up for line queuing outside of the Spirit Theater on the second floor of the museum. Bullock members will have priority seating which begins at 1:30 p.m. Members must present their membership card at the theater for early access. All other guests will begin seating at 1:40 p.m. Concessions from the IMAX lobby will be allowed in the theater. Music Under the Stars is a free concert series held each July in the Bullock Museum's Lone Star Plaza. The public is invited to experience free concerts under the iconic Bullock Museum Star from 6 to 9 p.m. with complimentary garage parking. Bring the whole family, camp chairs, and blankets to enjoy an incredible lineup of Texas artists.